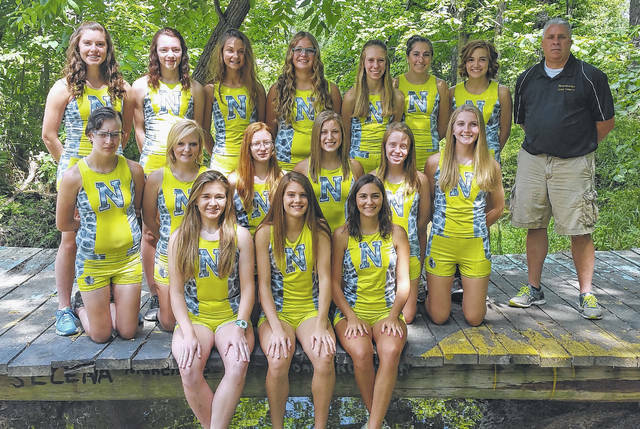 In his 20th year as head coach of the Northmor girls’ cross country team, Mark Yaussy returns 11 letterwinners from last year’s state-qualifying team. Back are seniors Brooke Bennett, Sammie Grogg and Viv Cutrupi; junior Sam Peters and sophomores Frankie Cutrupi, Julianna Ditullio, Jessica Duryea, Brooke Huntsman, Maddie Jordan, Sabrina Kelley and Carolyn McGauley. Yaussy noted that Bennett, Peters, Ditullio, Duryea and Jordan won all-conference awards last year and also all were on that state-qualifying team. Peters, Ditullio, Duryea and Jordan also were all-district runners. While the team graduated Kristen Duryea, an all-conference and all-district runner who also was a state qualifier, Yaussy has confidence in his team’s hopes, as they have a lot of new talent coming in. He said that Julia Kanagy, Kristie Wright and Olivia Goodson all have potential to run varsity this year. Yaussy is hoping his team can be in the mix in the conference meet, as he expects a competitive race. Northmor’s girls’ cross country is out to make a return trip to the state meet this year.